This is a guest post from Cathi Bert-Roussel. Traveling through Europe with your pet is one of the most rewarding experiences a globe-trotter can have. While most European countries are incredibly pet-friendly, getting into Europe with a pet is not always so easy. Travelling around Europe and subsequent visits become a lot easier once you get an EU Pet Passport for your pet. What’s Inside an EU Pet Passport? And a Pet Passport Photograph! First-time pets traveling to the Continent must carry a seven-page EU pet import license (also known as EU Annex IV). This complex and confusing document must be filled out by your vet and endorsed by your country’s animal regulatory agency no more than 10 days prior to departure. Following all of the steps toward completion takes about seven to nine days. Timing is critical to having the document in hand prior to departure. The form can be found on most EU embassy websites or via www.pettravel.com with instructions, for a small fee. Once you arrive in Europe, an EU Pet Passport is relatively easy to acquire and can be used on return trips to the continent, eliminating the need for the horrible EU Annex IV. The European Union Pet Passport scheme allows holders to travel with their pets to and from the EU and between European Union countries. The program was created to establish a standardized protocol for EU residents to transport their companion animals in and out of the region. The little blue passports are issued only by official EU veterinarians for dogs, cats and ferrets when transported for non-commercial purposes. There are several benefits to having an EU Pet Passport including hassle-free border crossing with your pet, eliminating the need to fill out confusing paperwork and a convenient place to store your pet’s inoculation record. Traveling through Europe with a Pet Passport in hand means no additional required travel documents are needed for your pet. The actual passport contains your pet’s health status, your name and address, pet identifying information such as breed, physical traits and microchip number and an optional pet photograph. As long as your pet’s rabies vaccination is kept current and recorded in the passport by a licensed veterinarian, this document never expires. 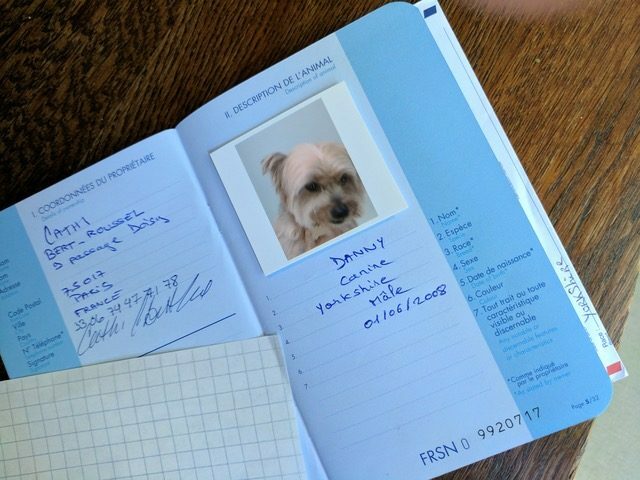 I obtained an EU Pet Passport for my dog during a six-month stay in Paris. At first, I was worried that not having EU citizenship or permanent resident status would disqualify me from applying. I found out this was not true. It was an easy exercise and completed in a 30-minute visit to a veterinarian clinic. The cost was 70 Euros, and when compared to what I spent for Danny’s Annex IV ($150 USD all in), very reasonable. The steps to obtaining a pet passport are simple. The first is to make an appointment with an official EU veterinarian (nearly all practicing vets in Europe are “official”). A quick Google search for English-speaking vets led me to Dr. Pierre Metivet in Paris. When making the appointment, tell the office staff the purpose is to obtain an EU Pet Passport. At the appointment, the attending veterinarian or staff will take your pet’s vital signs, scan for a microchip and address any health concerns or questions you have. The veterinarian will perform a basic health exam on your pet, review your paperwork and fill out the passport book. 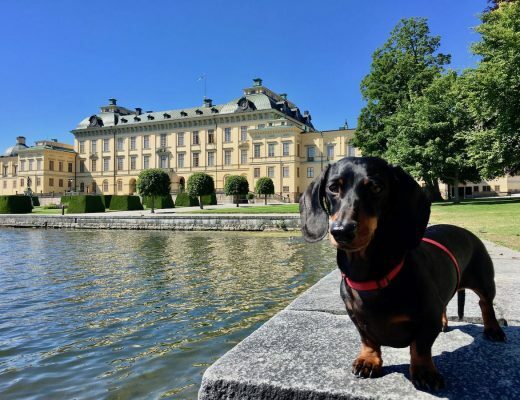 If you plan to travel to the UK, Ireland, Malta, Finland or Norway during your Europe stay, be sure to ask the veterinarian about additional entry requirements for these countries. Each requires a tapeworm treatment to be given within 1 to 5 days before arrival. Your EU vet can advise you on the appropriate timing of the medication dose. The second step is to purchase one passport style photograph of your pet and affix it to the space provided in the book. The size should be 2 x 2 inches (50mm x 50mm). Including your pet’s photo is optional but I was told by Dr. Metivet it is better to have one as you do not want to give any customs official a reason to deny your pet entry into a country. You may find you never need to show your pet’s EU passport except upon entry to Europe. But having one means your pet has met all requirements for legal presence and is free to travel throughout Europe (with limited exceptions). An EU Pet Passport means the only thing you and your furry travel companion have to worry about is having a good time. Cathi Bert-Roussel is a North Carolina based writer and editor of Triangle Paws Magazine. She is an avid world traveler with her dog, Danny, who has more stamps in his passport than she has. When not traveling, she and Danny sniff out dog-friendly establishments in her home-town of Raleigh. Since originally publishing this post, I’d thought I’d go into a little more detail about some aspects of how to get a pet passport that come up repeatedly. So here’s some more detailed information on two key aspects: how long it takes and the cost to get an EU pet passport. How Long Does it Take to Get an EU Pet Passport? Generally, an EU pet passport can be issued on the spot. However, it is best when you make an appointment that you advise the veterinarian staff that you want to get a pet passport, in case they don’t currently have any blank passports. The duration of the appointment will depend on the veterinarian needs to do to fill in the passport. If your dog already has a microchip and has been vaccinated against rabies, then the appointment will be quick, generally 10-30 minutes. It may be longer if your dog needs to be microchipped and hasn’t yet been vaccinated (or this may be done over multiple appointments). How Much Does an EU Pet Passport Cost? 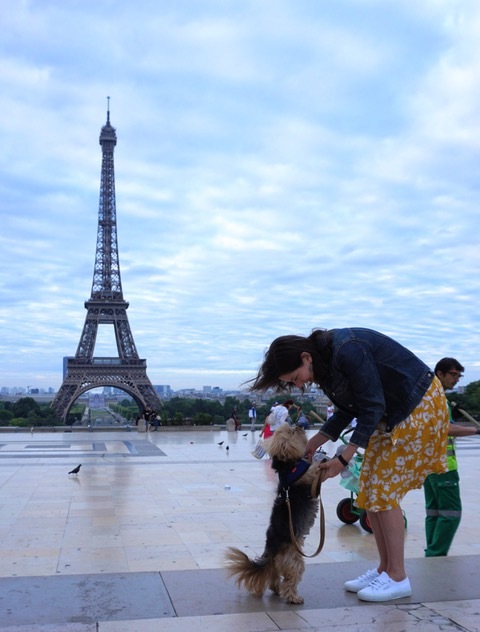 Cathi mentioned above that it cost her €70 to be issued a pet passport in Paris, including a basic health exam and using the Annex IV paperwork. However, the cost to get an EU pet passport can be more expensive or cheaper than this, especially between different countries. Based on response in a Facebook group that I’m a member of, the cost of an EU pet passport can be as low as €10-€15. There were reports of EU pet passports costing this little from the Netherlands, France, Italy and Spain. However, this is probably more likely if you visit your regular vet or if get a pet passport in addition to other vet services, charged separately. I’ve also heard of a quote for £250 (€290) for someone in the UK, but this seems extreme. The UK however does seem to be more expensive than elsewhere in the EU. This was incredibly helpful! I went through all of this the hard way and you basically detailed everything I learned in such a clear and concise way. 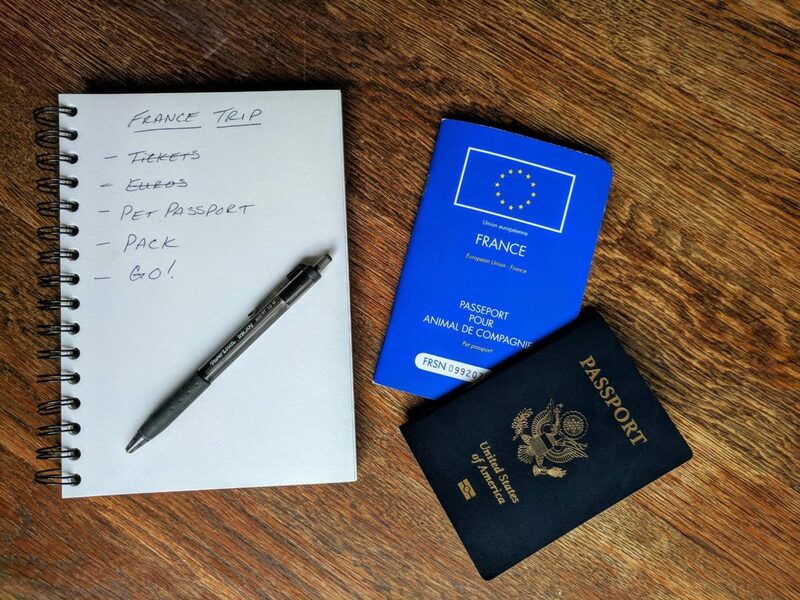 I’m sure many have found this helpful (even me reviewing the points and especially the pet passport part!) Thanks so much! That’s great to hear! Hope you’ve had a great time travelling with your dog in Europe! You are very welcome. I must admit that I was very intimidated by the prospect of getting the pet passport. But once I started the process, I was amazed at how easy it was. The hardest part was calling a veterinarian to make an appointment with my terrible French. I haven’t yet travelled to the US myself, but I’ve confirmed the requirements with someone that has travelled multiple times from Europe to the US. They’ve stated that in addition to taking their EU Pet Passport with the rabies certificate, they go to the vet a day or two before their flight and get a certificate of good health. In this the vet states the dog is up-to-date on all its vaccines and is generally in good health to be traveling. How does your dog do on long flights? Mine has been in his pet carrier up until 8 hours and he did great. But I’ll be flying for about 10,5 hours AND there will be a 7 hours time difference. I’m wondering how this will go.. Care to share your experience? The only long flight we’ve done with our dog was from Australia to Europe, where due to regulations he had to go in the hold. The flights we’ve done in Europe have only been short (up to 2 hours), although we’ve done an overnight ferry crossing to the Netherlands where he was on the ship for at least 10 hours. And while we could take him out to a deck area, he wouldn’t consider it for doing his business as there was no grass or similar! 10.5 hours isn’t much longer than 8 hours, so hopefully your dog will cope as well as on previous flights. I wouldn’t worry much about the time difference. He won’t notice it as first, while in artificial environments, and dogs tend to sleep a lot more in the day compared to us humans so probably adjust easier. Our dog was fine with the 10 hour time difference between Australia and Spain. He probably had less jet lag than we did! One year later! Thank you for your reply. I did travel to Belgium a year ago. Everything went well, I got the EU passport 10lbs dog again to Belgium in a couple of weeks. I did notice that (US) airlines are make no it more difficult to travel with pets. Oh, when I got back to the US last year – after 7 days – everything went smooth. I declared him and they did not ask for paperwork as he came from Belgium, which is considered a “safe country” for rabies in the USA. We travelled to the US from Paris in October last year and found the same – they were very relaxed! Glad all went well! I will be travelling back to Europe with my pup in June. We have lived in France before and I got her an EU Passport while there. However, her rabies vaccine will need to be given again in the USA before we go, so do you know if I will still need all the extra paperwork? (As if she didn’t have an EU Passport) And if I don’t dpes the vaccine still need to be administered by a USDA accredited veterinarian? Thanks in advance! Always nice to hear of other well travelled pups! This is Shandos. Unfortunately, you’ll have to have the booster recorded on an third-country official veterinary certificate, so the same paperwork as when you originally travelled with your pup from the USA to Europe, plus administered by a USDA accredited veterinarian (if that’s a requirement for getting the paperwork). Don’t get your vet to record the booster in the EU Pet Passport – I’ve heard of someone who did this and invalidated the passport. The UK government website (which has the same rules as for pet travelling to France), is unfortunately quite clear about this. See: https://www.gov.uk/take-pet-abroad/rabies-vaccination-boosters-and-blood-tests and https://www.gov.uk/take-pet-abroad/pet-passport. Enjoy your time in France! I’m just about to head there tomorrow and can’t wait to explore more with my dog. Also, if you’ve got my questions, I’ve just started a new FB community: https://www.facebook.com/groups/dogfriendlytravelrtw/. Open to all questions about traveling with a dog! This is crazy! How would I get EU passport for my dog here in Canada if there is no EU approved veterinarian in whole country? You can only get the EU passports when you are in Europe. Instead, in Canada get an authorised veterinarian to complete an “EU Annex IV”, or “animal health certificate”. This may need to be also endorsed by the relevant government authority. For more details, see https://travelnuity.com/travelling-to-europe-with-a-dog/ and speak to a vet in Canada familiar with preparing dogs for travel. The EU Passport is designed for dogs living in Europe, or at least spending an extended period in Europe. It’s not required for a dog to enter Europe. Hi~ Thanks so much for the information! I brought my dog from the U.S. last year to Finland and am living here permanently now. My dog doesn’t have an EU passport but we want to take a 4 day vacation to Barcelona on June 1st 2018. Do you know if I can just use paperwork that I have from the U.S. or if I need to acquire an EU passport?? Also, Finland required tapeworm treatment when I was coming from the U.S. but if I just take this short trip to Barcelona, do I still need to get a tapeworm treatment there during my 4-day stay before flying back into Finland?? Thank you in advance 🙂 !!! Jene – Hope you got the detailed reply that I sent you via Facebook! For any other readers, the short answers are yes, you’ll need an EU passport, as the papers are only valid for 4 months, plus you’ll need to get the tapeworm treatment again, and that will need to be recorded in your new passport. Thanks for your answer ! It give detailed information for me to get a EU pet passport for my cat. We plan to travel to Ireland after France. Have you travel to Ireland ? Do you know whether there is an airline from France to Ireland that allow pet to travel with people rather than traveling alone as a cargo? I did try to find some information but failed. But as you suggested, I will contact with Dr. Pierre Metivet for extra requirements for Ireland. Anyway, thank you so much!! That’s great to hear about the pet passport! Unfortunately, both Ireland and the UK only allow pets entering the countries to travel as cargo, except for service dogs – this is a government regulation. (This doesn’t apply travelling the opposite direction, to there are a few airlines that allow pets to travel in the cabin or as checked-baggage when leaving.) If you don’t want to have your cat travel as cargo, there’s two alternatives. If you have a car you can take the Eurotunnel or a ferry across the channel, then drive across England, then take another ferry to Ireland. If you don’t have a car, from Paris the best option is to take the train to Dieppe, the DFDS ferry to Newhaven, trains across England, then one of the ferries across to Ireland. 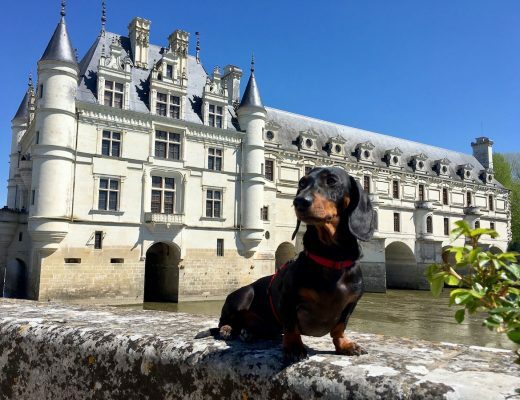 I discuss the options for transporting a pet to the UK in this post: https://travelnuity.com/dog-travel-between-uk-europe/. All the best! Hi，thanks for your useful information. But I am wondering whether there is a possibility for me to take a ferry from France to Ireland directly rather than going to England firstly then transiting to Ireland. Do you have any experience for this? 3. Brittany Ferries – Unfortunately, foot passengers aren’t allowed pets. I will be flying to Paris from Toronto the beginning of January and staying 3 months. I have a vet who is familiar with the process and also know to get the gov’t agency paperwork, BUT when I arrive in Paris, I will get on a TGV train to Nice. I can get a Pet Passport in Nice, but will the paerwork I have be enough for travel on the train? I have tried to look at the various sites, but cannot figure it out. Diana – That will be fine. I’ve sometimes seen in the train rules that a pet passport is required, but I have never had this checked. I’ve travelled by train in many European countries (France, Italy, Germany, Switzerland, Austria, Spain, Belgium, Netherlands…) Just keep the paperwork from Canada with you in case – their main concern will be that the dogs has been immunised against rabies. Shandos, thanks to your post, I’ve got EU pet passports for my two dogs in Spain. It was amazing and unforgettable experience!! And I think I’m really lucky to find your post by googling. That’s great to hear! Have a fabulous time travelling with your dogs! Shandos, I’m getting an EU passport in Switzerland this week (I come here every year (the month of June) then back to the US and I return to Switzerland in August. I don’t need anything to travel back home to the USA (she’s going home correct?). Andrea – For returning to the US, you’ll need the proof of rabies vaccination plus a health certificate. I’m not 100% sure if the health check entry in the EU Pet Passport is accepted (I’m not flying to the US myself until October), so I would request a typed letter from your vet in Switzerland. (From http://www.pettravel.com/immigration/UnitedStates.cfm: “A licensed veterinarian must complete and sign a veterinary certificate. This certificate should be in English or be accompanied by a version translated in English. It should identify the animal, the dates of vaccination, the manufacturer and the expiration date of the rabies vaccine.”) Some airlines also require a health certificate. That’s a tricky case about the rabies booster. It’s not clear on the EU website, but the relevant UK website states: “Get a third-country official veterinary certificate if your pet needs a booster vaccination while you’re outside the EU.” I would follow this guideline – which unfortunately means a health certificate from a US vet then USDA approval. However, one way to get around this would be to have the rabies booster while you are in Switzerland, and have the vet record it on your new pet passport. I know the vaccine isn’t due yet, so I would check with the vet about this. I did something similar – my dog had a 3 year rabies vaccine before arriving in Europe, but then I had a booster after 1 year in Europe. 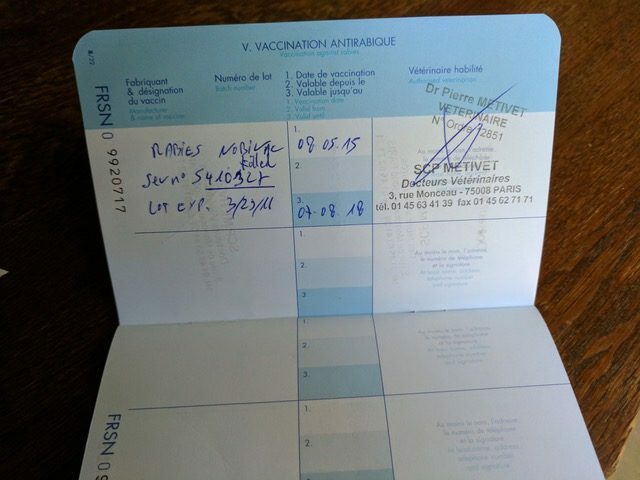 Partially as some countries don’t recognise the 3 year vaccine, but also so I had the entry in the EU Pet Passport and it makes paperwork a lot simpler. Enjoy your summer in Switzerland – I’m very jealous, we loved our time there! This is such a great post! Quick question. Where did you purchase a pet photo? I’ve got the passport for my cat and am traveling with her this week-end from France to Spain, but have no idea where to get a photo. Did you just take your dog into a photo booth? I recommend using a photo booth, unless you want to print out one of your own photos in a photo printing shop. If you can’t get it done in time, don’t worry, it shouldn’t cause any problems, it’s just good to have it too. Woww, this article was really interesting. We traveled from Amsterdam to Los Angeles with our cat and we have the EU passport but his rabies vaccination gonna expire 2 days before we fly back to Amsterdam I can not find any information about, can an U.S. Veterinarian stamp the new vaccination into the EU passport or not? I am afraid only an EU Veterinarian can stamp into the EU passport. What do you think? thanks a lot for this blog owner, I will visit this blog again to get a new idea for traveling with my pets. please feel free also to visit my pet care blog. This is very helpful, many thanks for sharing it! I was wondering whether you had any issue with having the rabies vaccine only handwritten? My previous vet used stickers for each vaccine/worming etc but the last rabies was entered in writing and slightly concerns me whether they will be problematic about it when I’m travelling via plane in a few weeks. Many thanks for your help! When I went to the UK, I had an issue raised with the rabies vaccine, as it was dated before the reading date for the microchip from when the passport was issued. However, I got around that by showing other older documents with the microchip number. No mention was made of it being written, rather than the stamp. And no issue was raised when we flew in Europe. I wouldn’t expect that you have issues, as long as the full details of the vaccine are recorded. Also, it’s a newer requirement that clear plastic stickers are placed over the writing, so it can’t be changed. Did your new vet do this? Many thanks for your reply! I only heard that it needs to be covered with plastic sticker only when a sticker is placed in for the vaccine? Can you please share where they say that the whole area has to be covered with laminated stickers? 🙂 I have clear sticker above previous vaccine stickers but never heard that everything needs to be covered up now. I can’t actually find anything online, but this was mentioned to me by the vet I saw in Germany in December 2018. Maybe she meant when it accompanied the sticker placed for the vaccine. She put it over the handwritten information accompanying the vaccine. Alina – I assume the health certificate from your vet is the Annex IV form (EU health certificate) required by the EU? That’s all that’s required to fly to Paris. But the UK also requires your dog to be administered a worming treatment by a vet, between 24 hours and 5 days of arriving in the UK. If you were travelling immediately on to the UK (less than a day), it’s possible to get this before flying to the EU and have this recorded in the EU health certificate. But as you’ll be spending extra time in Paris, I recommend visiting a vet in Paris. They will also give you an EU pet passport to record the worming treatment. Make sure they record the time, as the UK authorities as strict about it done to the hour. Hello, Thank you for all of the info. I also read on the UK site about ‘third country’ vets not being authorized to add ‘third country’ rabies vaccines into the EU Pet Passport. I am really starting to think that this is a UK thing only. Today my pup got his EU Pet Passport in Italy (yay! ), and at the very serious and official ASL office, ALL the people I asked said that of course a US vet who is authorized (meaning licensed) to give a rabies vaccine is also authorized to input the US rabies vaccine into the Pet Passport. When I explained what I had read on the UK site, they were completely perplexed and said it made no sense. UGH! The ASL vet also said I should take the passport back to the US vet so that he may input the rabies vaccine info into the passport. It is so frustrating because now I don’t know what to do. I don’t really need the pet passport to travel out of Europe, but I definitely want to avoid getting those USDA papers again when I come back in 3 months. Another issue that is confusing me is Italy’s ‘pet export certificate’ I read about on the US-Italy consulate page. It said that to leave Italy, the dog must have a current rabies shot administered no less than 20 days before travel and no more than 11 months before travel. Again, my pup has a valid 3 years rabies vaccine (from only 22 months ago), and the Italy ASL vet said of course that is no problem – She is going to fill out his health certificate using that information since according to Italy, my dog is up to date on his rabies vaccine. There could not be a group of folks in Italy that would know more about how the system works than these people today. This was the very official ASL office that deals with these issues every day. Kay – I’ve always been told to not let vets outside of the EU write in the pet passport, at least the rabies section. (I’ve heard conflicting information about recording worming treatments.) I would try and get a rabies vaccine inside the EU so it could be recorded in the passport and avoid heading to the USDA office again. I’m not sure about the export certificate for Italy. It seems to be different compared to elsewhere in the EU (it wasn’t required when I flew from France to New York). I know someone who flew from Italy to the US, but I can’t remember their name, otherwise I would put you in contact with them. Maybe also check with the airline you’ll be flying? They’re usually the ones who check the pet paperwork.